The first edition of the social AND family day has taken place on a sunny Sunday of June. ‘escent was pleased to meet Handi-Rando for the second time. The concept of the Handi-Rando is to go for a walk in the nature with people who are no longer able to walk. Helped by adapted wheel chairs (Joëlette) one can walk them in enchanting landscapes. We all gathered in the morning in the charming Val Dieu Abbey (Aubel area – close to Liege). The group was divided and each participant had the opportunity to visit the brewery and take part in the preparation of the meal. In the meantime “Mini-escenters” participated to a treasure hunt in the park of the abbey. After a fine beers and cheese tasting, we shared the meal prepared all together under the direction of Françoise Chapelier. We could discover the basic concepts and taste living food cuisine. A new experience for many! The highlight of the day came with the departure for the walk. 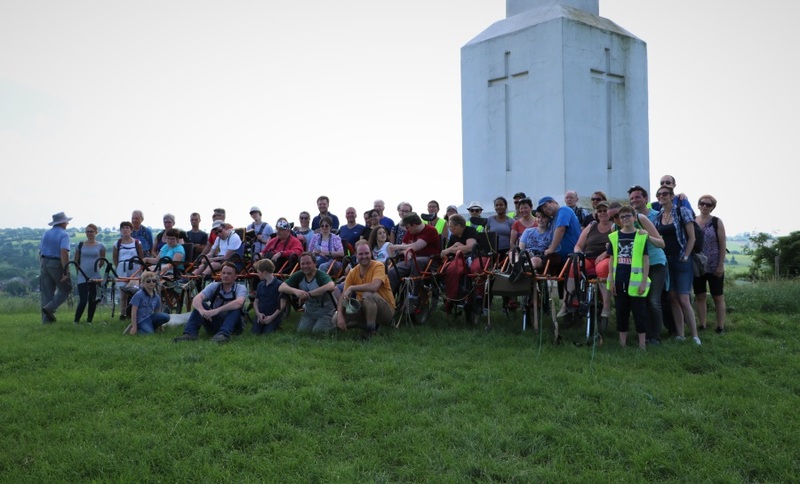 9 persons in Joëlette (adapted wheel chairs) accompanied by a group of 35 people started a beautiful itinerary of 5 km under the Belgian sun. After the ascension to “Croix de Charneux”, we could enjoy a unique 360° view on the “3 borders region”- where Belgium, the Netherlands and Germany meet. The day ended with tasteful smoothies prepared by the children who didn’t join the walk. Such days off the beat remind us of how enriching meeting people from different horizons can be. These very human moments will surely be remembered by most of us. Meeting the families of our fellow colleagues was also a real pleasure and we hope to share such memorable moments soon with all.